Shadow Soundings involves creating a real time connection between the 25th of April Bridge and MAAT in Lisbon. Live cameras, microphones, accelerometers and hydrophones will create an abstract real time media art work for the 800 Square Meter Oval Gallery, the main exhibition space in the Museum. The exhibit opened on October 5th, 2017. 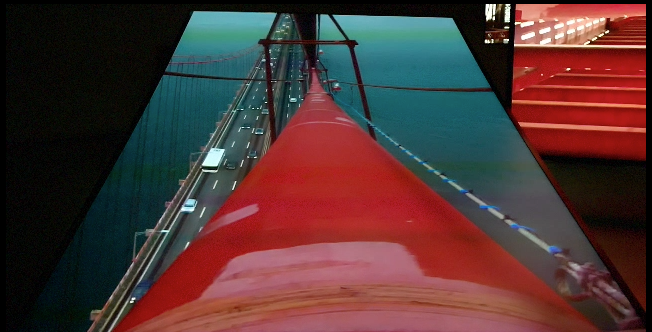 There will be 7 Channels of live video from cameras under the roadway, on top of the South Tower and gazing upward from the base of the South Tower. The moving images will be projected onto hanging screens viewable on both sides, and on screens in the ceiling and the white floor. An immersive sound sculpture will be created from two parallel rings of speakers. One ring will surround the inner core of the Oval Gallery and will play a sonic choreography made from the oscillating tones of traffic over a steel grid roadway and accelerometers picking up the accumulative sonic energy in the main suspension cables. A second parallel ring of speakers will be in the outer walkway ramp surrounding the Oval Gallery and will play a spatial composition derived from live hydrophone in the Tagus River. This live hydrophone sound will also be played from speakers on the river facing facade of MAAT.